Our Teachers are Miss Farley and Mrs Jennings and our Teaching Assistants are Mr Mullen, Mrs Irwin, Mrs Restell and Mrs Fowkes. We’ve had a busy last week of school and have worked hard to get our lamps and ear defenders finished. A big well done to all the children for working so sensibly when making the electrical circuits and taking care when designing their lampshades. We’ve also been busy finding equivalent fractions and writing some wonderful Narrative Poetry. Have a lovely holiday and come back feeling refreshed and ready for more fun! Just a quick note about homework. We had great fun during International Week exploring all the different games and sports in Europe! We tried out mini-Maypole Dancing and Ski-Jumping, rounders, traditional lawn games and many more! Thank you so much to all the parents and helpers who ran amazing workshops throughout the week! This week we are back to finding fractions of amounts and using different measurements in Maths, and reading and writing Narrative Poetry in Literacy! Our lamps for our D&T project are coming together and we hope to show you the finished products soon! 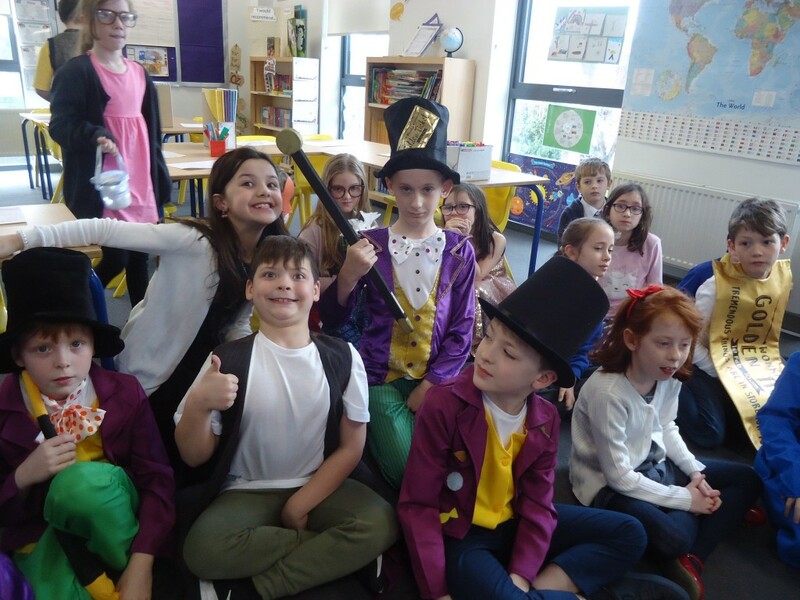 What wonderful costumes the children wore today! We’ve had an action packed day of reading to younger children and reading as a class. Year 4 chose to read the Roald Dahl book “The Giraffe, the Pelly and me”. We explored the theme of teamwork and complimenting others, which led to us writing compliments to everyone in the class! In the afternoon, we identified the talents of different animals and design businesses based on the skills of 3 animals. We even wrote jingles, raps and songs for our businesses based on the rhymes we found in Roald Dahl’s book. Homework went out today and you will find your login at the back of your homework book! Enjoy! The children have worked incredibly hard to complete their pop up books this week. They have included levers using split pins and other paper pop-up mechanisms. We plan to take these to read to Phase One children at the end of the week. In literacy we have been reading explanation texts and are working creating inventions of our own to explain. Wallace and Gromit have been an inspiration for our ideas! In maths we have continued our work with decimals involving money. This week we have been learning about decimal numbers in maths involving regrouping, comparing and ordering. In literacy we have been using our powers of effective description to describe different religious settings in preparation for our stories next week. We have planned our pop up books and created mini stories based on electricity for younger children which we have been typing up. We look forward to completing these next week. The past two weeks have involved multiplication and division strategies in maths (which you will find at the back of the homework book). We have combined our literacy and geography topics to write persuasive letters about the environment some of which you will find in our class rooms. In Science last week, we predicted whether a circuit was complete or not and problem solved. This week we have been identifying and creating symmetrical shapes including finding ways of checking how many lines of symmetry a particular shape has. Did you know that a regular polygon has the same number of sides as it does lines of symmetry? In literacy, we have continued to explore persuasive techniques and are building towards writing our own persuasive letters about the environment next week. Happy New Year and Happy 2019! We have been busy this week and are excited about starting our new topic “Light and Sound!” In Science today, we went around the school searching for electrical appliances and then sorted our findings into a Venn diagram depending on whether the appliance used the mains supply or was battery powered! We also explored the school during Maths this week as we searched for parallel and perpendicular lines. We have talked about the properties of shapes and used lots of technical vocabulary. In Literacy, we have started our topic of persuasion and have started looking at climate change and how it affects our world. Next week we will start to use more persuasive language to write letters about our thoughts on climate change.